Tomorrow morning at 9:05 on my Club Organized Facebook page, I'll share a video and talk about fun gift-giving ideas, like this one. The boxes are just stacked together (I didn't glue them). 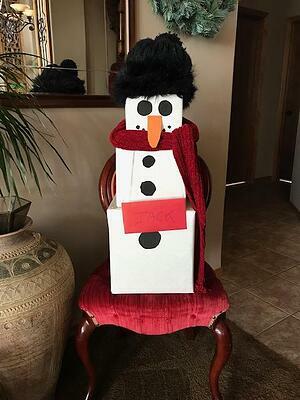 If you have to ship the packages, the person on the other end will be able to stack them because the buttons and face are glued on to create the snowman. If you order the Stick it Right on the Money Gift-Giving Kit now, it'll get to you in plenty of time to create a bunch of gifts for Christmas and with this savings you'll only pay $13.95 plus postage and handling. I'm running this special until Sunday and while supplies last, I'm also going to give you the ELM (Everybody Loves Money) DVD which has ten creative ways to give cash. That DVD sells for $9.95, but I'm ultimately working toward having just digital merchandise, so I'm giving them away when you buy the sticker kit. To go to my Club Organized Facebook page, just use this link https://www.facebook.com/thecluborganized/ and I'll be there waiting tomorrow morning at 9:05 Pacific time. Put it on your calendar, or you'll forget.